I can be extremely driven and stubborn when I'm looking for the perfect online purchase. I have a tendency to find something I love, discover it's sadly more expensive than my budget, and then scour the entire internet until I find a more affordable dupe! It can be a bit time consuming (although it's excellent to do while mindlessly watching TV), but when you finally do find your dream item at a discount, it's a fabulous feeling! You may have seen my recent post HERE on fall fashion must-haves. These are items I fell in love with for fall, but to be honest, some of them I just wasn't quite willing to splurge on. For those that feel the same way, I wanted to share with you the spoils of my online shopping research! Below, you'll see my original find, the 'splurge', accompanied by the 'steal'- the result of my thrifty searching. I actually purchased 2 out of the 4 items on this list already, as soon as I found the 'steal's! And in fact, one of my best friends found an even better 'steal' for the silk pyjamas I was looking for - she spotted some gorgeous cream satin pyjamas with black piping from Jones New York while at Winners! I literally raced to Winners to pick up a pair...for $30!! Now that was a steal. Always keep your eyes open - you never know when you'll spot that perfect piece on sale. 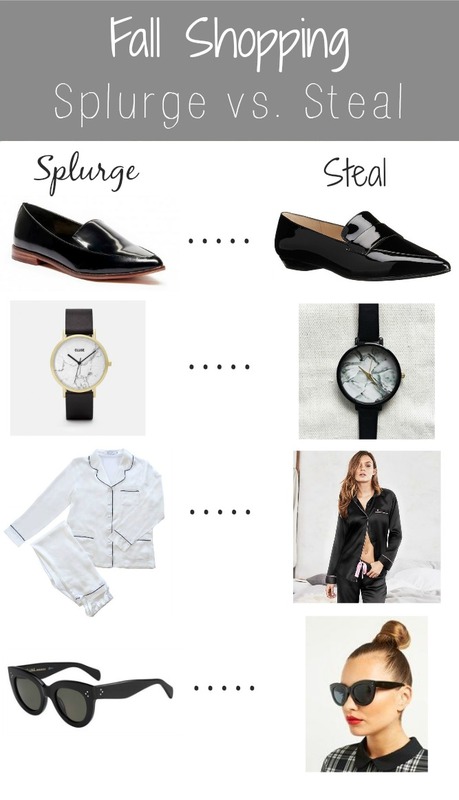 Hope these help keep your fall fashion shopping within budget!